Few	DJs and producers have credentials	quite	like Sammy Dee’s. A longtime fixture of Berlin’s club scene, a cornerstone of the esteemed Perlon imprint and	a regular DJ and Panorama Bar and Club der Visionaere, his taste and signature style could hardly be more well-­‐honed. Earlier this year, he	created a	new	platform for his unique take on house and techno: Ultrastretch, a label that hit the ground running with a 12" inch by Matthew Burton. 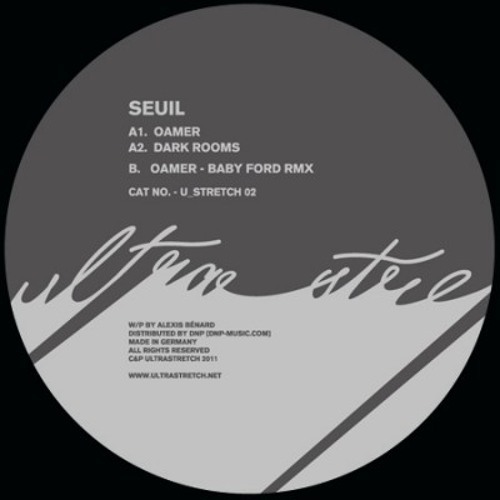 Slick,	modern and touched with surrealism, the record had all of the unique flavor one would expect from a label by Sammy, proving his skills as a selector extend well beyond the DJ booth. Ultrastretch’s second release lives up to the same high standard. Much like Matthew Burton, Seuil is a highly imaginative producer who’s kept a low profile despite a string of excellent records. Based in Paris, his lean and funky sound has placed him at the forefront of his city’s reemerging party scene. Many of his past releases have been punchy but subtle, balancing dance	floor	utility with an ear for restraint. On “Oamer” he	goes	even	deeper than usual, crafting a vivid afterhours track out of hypnotic drums and	bleary-­‐eyed chords—nervous one moment, euphoric the	next. Like its title suggests, “Dark Rooms” is a clubbier affair, charging ahead	with fragmented vocals and a brisk driving rhythm. This	is one to put on as the night turns serious. For the final track, Sammy brings in an old	friend:	Baby Ford, one	of Germany’s finest purveyor’s of skeletal, ultra-­‐deep electronics. His	remix of	“Oamer” expands on the	original’s	dreamy side, with sanguine chords and abstract imagery layered over a crisp bass drum. Aimed at the DJ and the connoisseur, Oamer is one of the	classiest records of the year so	far, from one of its finest new labels.